Here at Sadie’s HQ, we eat more than our fair share of soup (and proudly too! ), but sometimes, you want one with a little more substance. 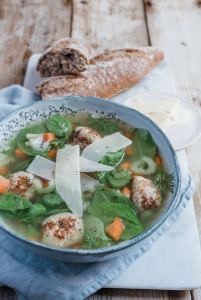 Our below recipe for wedding soup or Italian wedding soup is a traditional Italian soup consisting of green vegetables, meat and plenty of our delicious bone broth. Why not make it in bulk and freeze some for later? It’s also a perfect idea for a lighter supper option that still leaves you feeling full. For the meatballs, place the ground chicken, sausage, bread crumbs, garlic, parsley, Pecorino, Parmesan, milk, egg, 1 teaspoon salt, and 1/2 teaspoon pepper in a bowl and combine gently with a fork. In the meantime, for the soup, heat the olive oil over medium-low heat in a large heavy-bottomed soup pot. Add the onion, carrots, and celery and saute until softened, 5 to 6 minutes, stirring occasionally. Add the bone broth and wine and bring to a boil. Add the pasta to the simmering broth and cook for 6 to 8 minutes, until the pasta is tender. Add the fresh dill and then the meatballs to the soup and simmer for 1 minute. Ladle into soup bowls and sprinkle each serving with extra grated Parmesan.